The night before the EICMA motorcycle show in Milan officially opened its doors to the press, Harley-Davidson took the wraps off its first all-new model in 13 years: the 2014 Street, which will be available as a 500 and a 750 when it goes on sale in the U.S. this spring, priced at $6,700 and $7,500 respectively. In short, the new Street is a liquid-cooled bike aimed at young urban buyers around the world, a model that Mark-Hans Richer, Harley’s senior vice president and chief marketing officer, called “our path to the future.” Given that heady responsibility, the attractively priced Street—which will be built at Harley plants in Kansas City (for the U.S., Canada and Mexico) and India (the rest of the world)—deserves a close look. Let’s start with the engine, a liquid-cooled 60-degree V-twin whose chain-driven single overhead camshafts operate four valves per cylinder via roller rockers with screw adjusters. Called the Revolution X, this all-new powerplant, with a vertically split crankcase and plain bearings, is a modern design that traces its lineage back to the V-Rod of 2001. Jeff Coughlin, Harley’s chief powertrain engineer, says a 60-degree design was chosen to help reduce the height of the wet-sump engine, which helps keep seat height and center of gravity low, important considerations given that the Street is seen as a first bike for many potential customers. Separate aluminum cylinders are fitted with pressed-in iron liners, and the only difference between the 500 and 750 versions, which share a 66.0mm stroke, is the bore. The 500’s is 69.0mm, which makes for an actual displacement of 494cc. The 750’s bore, at 85.0mm, makes for a displacement of 749cc. Redline for both engines is 8,000 rpm, and peak power for the 750, though not officially announced, was said by one Harley rep to be 54 hp at 7,500 rpm, with 44 pound-feet of peak torque arriving at an unspecified rpm. A single balance shaft keeps the V-twin from shaking too much, and a six-speed transmission works with Harley’s familiar belt final drive. 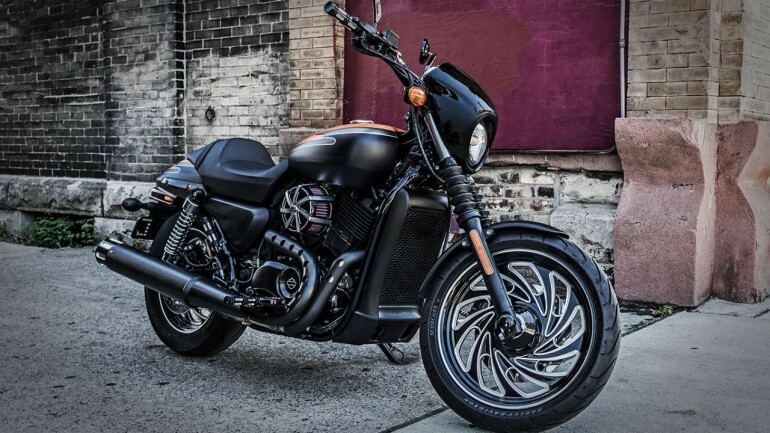 Korry Vorndran, Harley’s manager of product development, said the Street has been in development for the last two and a half years, and the goal was to produce a smaller, nimble bike that had enough suspension travel to handle rough urban streets. To that end, the blacked-out Street, which is based on a narrow, steel perimeter frame, offers two inches more travel front and rear than an Iron 883. “We wanted it to be light and fun, and have a more neutral riding position,” explained Vorndran, who added that Harley has been more weight-conscious with the Street than it has with other models. Both Street models, for the record, tip the scales at a claimed 480 lb. wet, which is roughly 80 lb. lighter than, say, an Iron 883. The Street’s fuel tank and fenders are steel. Other Street hardware includes seven-spoke wheels and a simple fairing inspired by Harley’s XLCR café racer from the 1970s, plus a slightly pulled back handlebar and a an attractive 2-into-1 exhaust. Single-caliper brakes are found front and rear, and components such as the headlight and turnsignals are designed for worldwide use, so they won’t need to be changed for the bike’s numerous markets. The most important new Harley-Davidson in living memory isn’t made in Milwaukee, but instead at H-D’s new factory in Guragon, India. * And, instead of targeting aging Baby Boomers in the West, it’s instead going after young riders in developing markets in foreign countries. Can it succeed? *Harley tells us, “Some of these bikes will be built in India, but not all. For example, all bikes for North America will be built — engine and whole bike — in our Kansas City plant.” Lacking further information on where the parts come from, we remain skeptical. Current staff consensus is that the U.S. market bikes are likely assembled in Missouri from globally-sourced parts, largely originating in India. We’ll get to the bottom of it. 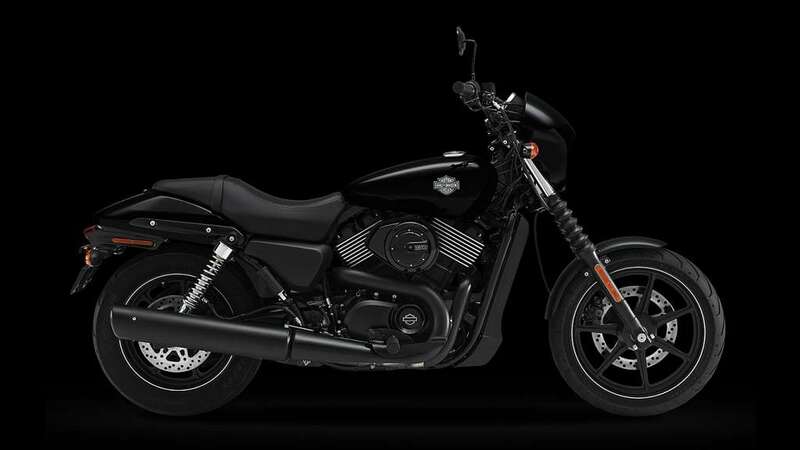 These new bikes are the 2014 Harley-Davidson Street 750 and 2014 Harley-Davidson Street 500. The 750 starts at $7,500 here in the U.S., while the 500 costs even less, at $6,500. Those prices are lower than Harley’s current cheapest model, the $8,399 Sportster Iron 883, if not as low as the latest crop of super-affordable Japanese bikes. The Honda CB500F likely out-performs either Street in any objective measure of performance, but starts at just $5,500. The 2014 Harley-Davidson Street 750 and 500 already have custom parts available. Picture here: custom wheels and air filter. 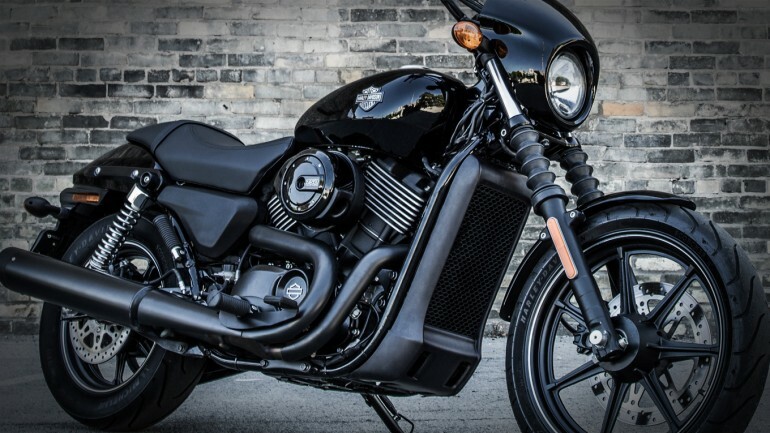 Initially, the odds appear to be stacked against these new Harleys. Not only are they made somewhere that’s probably not America, but they’re equipped with modern, liquid-cooled motors and priced at a premium to the competition. 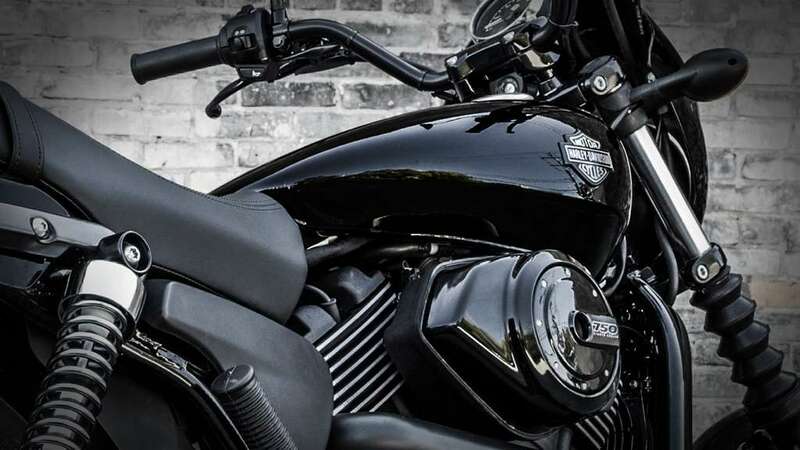 “If Harley can build a good bike outside of the U.S. that is well priced, looks good, performs well and brings new riders into the market they could be on to a winner,” says Harley owner, Harley book author and RideApart contributor Tim Watson. It’s those new riders that are going to be key. Currently Harley dominates the U.S. market, making around 185,000 of the 452,000 motorcycles that were sold in the U.S. in 2012. Far fewer than the 273,000 bikes it sold here in 2006. Compare that total market volume to India, which totals in excess of 10 million motorcycle sales year and you can see why Harley is eager to explore new markets. Currently, Harley sells around 2,000 motorcycles in India annually. It hopes these new models will expand that to 10,000 in the next two to three years. In addition to India and North America, Harley plans to sell the Streets in Italy, Spain and Portugal. Very few details of the Street’s mechanical specification are being divulged. Specs simply aren’t an area where Harleys traditionally excel. The official spec page lists 749 and 594 cc capacities, six-speed transmissions and 480 lbs (wet) weights for both bikes. While it remains a good deal behind that CB500F’s 420 lbs (wet), the Streets are considerably lighter than the next lightest model in the HD stable; the Iron 883 weighs in at a staggering 562 lbs (wet). Of course, Harley’s don’t sell on objective measures of performance, they sell on image and there, surprisingly, the Streets excel. They don’t look cheap, they don’t look small, they don’t look plastic. The tank and fenders are made from metal, the engines look impressively masculine despite their middling capacity and, judging by the video, they even sound suitably robust. “It looks great, sounds great, it’s a Harley, and it’s priced right,” described Harley COO Matt Levatich a few weeks ago. Will that be enough to create a new generation of Harley riders?